Fabric Mart Fabricistas: Made By A Fabricista: 2 Sand Colored Skirts! Made By A Fabricista: 2 Sand Colored Skirts! As we are patiently waiting for warmer weather here in eastern Canada (and we are long overdue!) I made myself two skirts in a sand color palette, which is a color I really love. My first project is a button front skirt and I knew it would be great in linen. Linen is a favorite among Fabricistas and customers in general, and FM always carry a vast array of colours and weights to suit all your needs. The colour of this one is called fawn and you can find it here while it's still available. I think I'm in love with it! Why not visit the designer linen page? Those designer linens are similar in weight and you can find many earth tone colors close to that of my skirt. I've always loved button front skirts, particularly in linen - they scream summer to me! When McCall's 7906 was released in this year's spring collection I knew I had to make it. This is view D, which is the longer version with large belt carriers and a sash. I made my usual size 10 and this pattern is true to size. My only adjustments were to release the seams a bit at the waist (it was a bit tight) and then to take in a bit at the hips. The assembling of this skirt is pretty straight forward with good instructions. A couple of pointers: slipstitching of the self facing is not an absolute necessity if you use interfacing as I did, and as it will be anchored by the buttonholes and buttons later. Don't baste the self facing until the very end as you have to turn it anyway when you sew the waist facing and you hem the bottom. It is not specified, but you have to press the back pleats towards the middle. Another thing I did differently was to add a featherweight interfacing to the front facings so it would stabilize the linen without interfering with the drape. I also topstitched the left facing (the side with the buttons) and it looks very nice in my opinion. 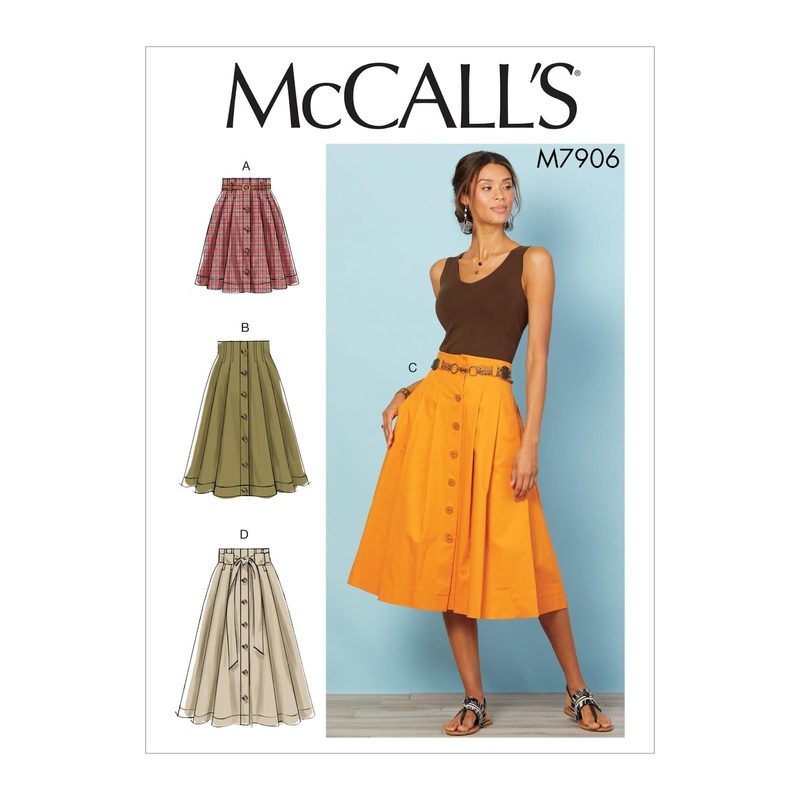 McCall's 7906 was a really fun project. I love the high waist, the slightly retro feel of this front buttoned pleated skirt, and I can't wait to wear it. The second project is another skirt. This is a B plan as I had something else in mind, but I didn't order quite enough fabric and had to come up with another idea. Fortunately or unfortunately, I have a large library of patterns accumulated over the years so it's always fun to browse them and pick something I still haven't made. 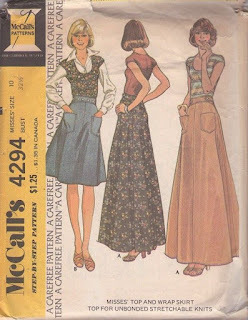 Another McCall's skirt here, but this one is a vintage back wrap skirt circa 1974. I made my usual size 10, but found that the waist is quite small in relation to the hips which are quite rounded and overall too big for me. I took in a bit at the hips but if I make this pattern again I'll redraw smaller and straighter hips. It has an incrusted waist which is beautiful and that was fun to topstitch. I chose silk taffeta for this project and treated it in a casual way. 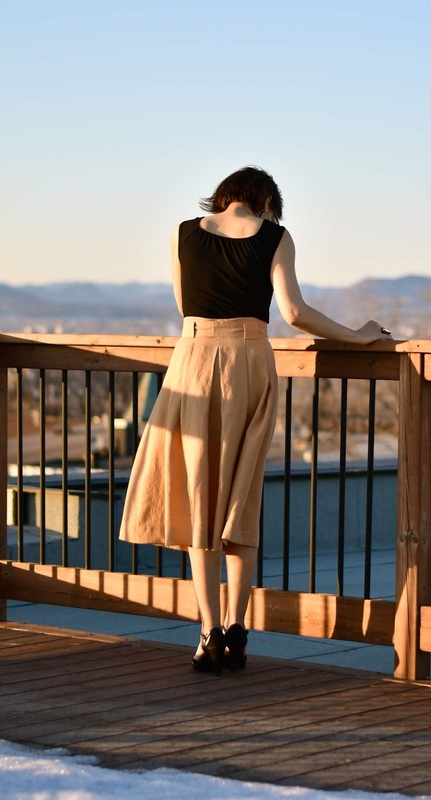 That is to show that silk taffeta doesn't have to be used only for dressy clothes, as it works perfectly for an everyday wrap skirt with pockets. The color of this taffeta is called medallion and there is still plenty available here. The price is quite spectacular - at 70% off you'll pay only $9 for high quality silk taffeta! This taffeta is lightweight and crisp and it was easy to work with. One side is slightly darker than the other (the one that has a more pronouced texture), but I chose the lighter one as the right side. Silk taffeta is a fabric that is excellent for architectural details and sharp corners. Here are 2 pictures showing the inside of the belt (topstitched from the outside), and a close view of one of the pockets. I will leave it there for now and I sincerely hope we have sunshine and warm weather soon so we can leave our winter gear behind. If you have been following me lately you know I have a couple of skirts waiting in the wings! I am strangely attracted to skirts this year - I find them so fun to sew! Is that a type of garment you like making? Love your new skirts! They look great with the black tops and shoes. The button-front one with the tie is my favorite! Gorgeous skirts and love the color for both. Looks great with black top. Made By A Fabricista: Hoping for Spring!